The deathstalker scorpion (Leiurus quinquestriatus) is a member of the Buthidae family, which groups some of the most feared and dangerous venomous scorpions in the world. 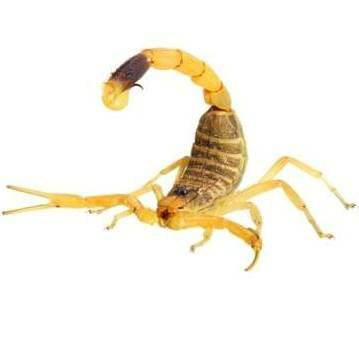 They are known by many colloquial names like Omdurman scorpion, Israeli yellow scorpion, Palestine yellow scorpion, Naqab desert scorpion and five keeled gold scorpion. Usually, these names originate from the exotic pet trade. To add to the confusion other species belonging to the genus Leiurus are also commonly referred to as "deathstalkers". The species scientific name can be roughly translated into English as "five-striped smooth-tail". They are found in many countries throughout North Africa and the Middle East. In the northeastern Africa, it's found in Mali and Algeria in the west eastwards to Libya, Egypt, Somalia, Sudan, Ethiopia, Chad, Niger, Tunisia. 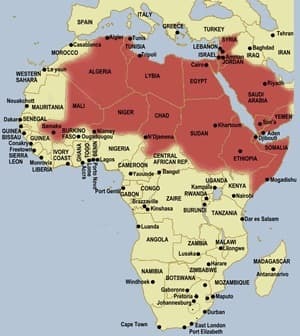 In the Arabian Peninsula, it's found in Iran, Lebanon, Israel, Saudi Arabia, United Arab Emirates and Turkey. It inhabits a diversity of terrains including arid and semi-arid areas, deserts and scrubland. The deathstalker range includes the Sahara, Arabian Desert, and the Thar Desert. ​The deathstalker scorpion grows between 1 and 4 inches (2.5 - 10 cm) in length, but usually averaging just under 2.5 inches. Females are larger than males because of their roles in reproduction. Their color ranges from a pale yellow to a rich yellow and green in color. Horizontal grayish stripes, scattered with others of orange or yellowish color are found in the cephalothorax and abdomen. The deathstalker lifespan in the wild is unknown, but other scorpion species live from 4 to 25 years. A prevailing myth states that scorpions with strong, powerful pincers have much less toxic venoms. But while the deathstalker scorpion has rather large pincers they are somewhat weak so it has to quickly and effectively kill prey using its very powerful venom. Yellow Scorpion (Leiurus quinquestriatus hebraeus) - Found throughout the Middle East in the north as far as Turkey eastward to Iran, and south to Oman and Yemen. Deathstalker scorpion (Leiurus quinquestriatus quinquestriatus) - Found in northeastern Africa from Algeria, Niger and Mali in the east as far west as Somalia. The deathstalker scorpion is considered one of the most dangerous scorpion species on in the world, and it can be very aggressive. Their rather uncommon venom is comprised of a highly toxic mixture of neurotoxins including Chlorotoxin, Charybdotoxin, Scyllatoxin and, Agitoxins. These are combined with powerful cardiotoxins which will induce cardiovascular and respiratory dysfunction. Making its venom one of the most toxic of any scorpion species. But despite their fearsome reputation a sting from a deathstalker usually isn't life threatening at least for healthy adult humans, but this doesn't make it less painful. Nevertheless, this should be considered a medical emergency, since even with antivenom treatment it usually requires a large dose of antivenom due to the venom's resistance to treatment. The sick, allergic, the elderly, children or people with heart problems are at a much greater risk of death in the case of a sting. Like any envenomation, one always runs the risk of anaphylaxis, a potentially deadly allergic reaction to the venom. Normally if death occurs it's usually due to pulmonary edema, a high rate of pancreatitis is also reported following envenomation. Like all scorpions, the deathstalker usually feeds on small insects, spiders, centipedes and earthworms. They also feed on other scorpions even engaging in cannibalism eating their own species. They are nocturnal normally hidden under stones, wood, bark, or other debris waiting to ambush their prey. Using its speed and camouflage to hunt prey. These scorpions are able to detect vibrations using sensory hairs found all over their legs using the vibrations to detect and capture prey in the dark. Once the prey is captured they use their large pincers to crush, weaken and subdue the victim they also attack it with their stinger if it fights back. Then they use the pincers to bring it toward their mouth and eat it. Not much information is available regarding the deathstalker reproduction, but like most scorpions they are viviparous. Embryos develop inside of the female's ovary uterus not outside on a different structure. Scorpions have a rather complicated process of courtship and sperm transfer the deathstalker is no exception. Both male and female perform a courtship ritual where they grasp each other pedipalps performing a form of dance lasting for several minutes. This unique movement is called a “promenade à deux”. It's then that the male ejects a spermatophore on a suitable surface. The male then leads the female to a position where its genital opening is just over the spermatophore and it can get the male's sperm. Once the courtship and sperm transfer is completed, male and female go their separate ways. The little deathstalker scorpions are born after a gestation period ranging from 122 to 277 days, and the females give birth to about 35 to 87 scorplings. The number of offspring is largely dependent on the size of the female. Again their parental behavior has not been studied, but in other closely related scorpion species the young scorpions climb onto the mother’s back right after birth and stay there for a few weeks. This gives them the advantage of their mother's protection and may also help them regulate moisture in their dry hot desert habitat. These scorplings are relatively large when born and like most scorpion species they molt, shedding of their exoskeleton multiple times before becoming adults. Even so, juveniles look like adults at all instars. Before females can reproduce they must molt about 7 times. Young specimens have a high mortality rate, many times falling victim of other types of scorpions including sometimes other deathstalkers. The deathstalker scorpion has not yet been assessed for the IUCN Red List, CITES or the US Fish and Wildlife Service. 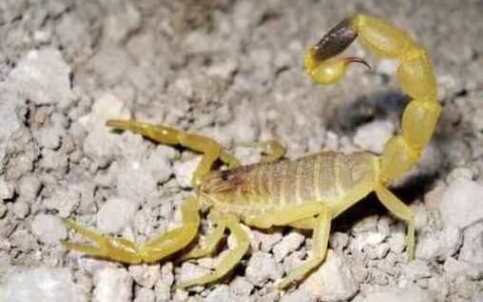 Although sometimes kept as a pet, many countries where keeping dangerous animals is usually prohibited by law possession of deathstalker scorpions may prove illegal or at least is heavily regulated. Considered the largest living lizards in the world, Komodo dragons are native to the island of Komodo and a few other islands.